We ship via USPS First Class, Priority & Express. All our shipping options have tracking and Priority/Express options are insured against loss. Using First Class outside of America is at your own risk due to the unreliability of some countries' Post Office systems. We can provide tracking but no insurance or refund if a package is lost by another countries post service (we offer full refunds if the parcel is lost within USA borders). We endeavor to pack and ship most orders same day (Mon-Fri before 3pm EST). However sometimes we require a little extra time to process the order. Variables include, but not limited to, the payment status of the customer, the billing and shipping information validity, security checks and the availability of the ordered item(s). Any free shipping methods may require up to 3 business days to process, but we work hard to try and ship all orders within 1 business day. CronusMAX.com processes and ships out packages Monday-Friday 9am-3pm EST; we are not open to process or deliver any packages during the weekend or major holidays. Do not consider the day an order is placed as day one. Begin counting from the next business day to get an accurate expectation of delivery time). We are not responsible for shipment delays that may occur. Customers are encouraged to plan ahead when placing orders online. *Please note that shipping times are given as a guide and are in no way guaranteed. Shipping times are based on working days only and do not include weekends or major holidays. Once the package has left our warehouse then it is in the hands of USPS and they alone are responsible for getting your package to you as fast as possible. Please also note that First Class International Shipping can be quite slow depending on your country. Sometimes it can get there within a couple of weeks, sometimes longer than 4 weeks. If you are not prepared to risk waiting a long time, we recommend you use the priority option. Shipping cost depends on the options you choose, the size and weight of your item(s), and the location of the order destination. To estimate shipping costs, simply place all the desired item(s) in your shopping cart and then proceed to checkout. Once you are on the shopping cart page, under Shipping Options, you can select the desired shipping option and the associated estimated cost will be displayed. You do not have to sign up for an account or make any purchase to view the shipping costs. We do ship to most countries in the world except for a small handful due to customs/security regulations. You can check if your country is available by asking for an estimated shipping cost when you add a product to the cart. A tracking number will be provided via email once an order has been shipped out. You can also login to your account and browse your order history to view the tracking number. If there is no tracking number then the item has not shipped yet (click here for Order Status info). After receiving the tracking number, you can click on the link provided in the email. 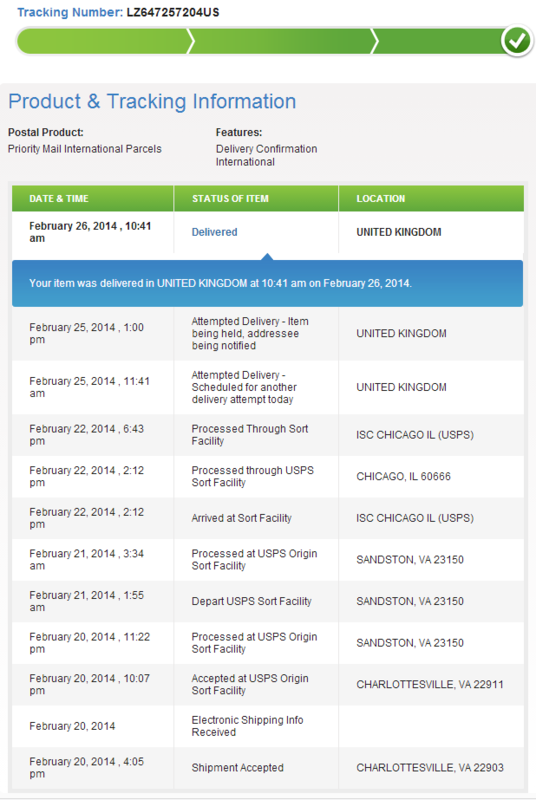 Alternatively, you can also track your USPS packages by going to USPS.com or by contacting USPS at 1-800-222-1811. Please allow at least 24 hours for USPS to update their system before tracking your order. If your tracking shows this notice: "Your item was processed through our ISC CHICAGO IL (USPS) facility on Month Day, Year at Time. The item is currently in transit to the destination." Then it has left the country and has been handed to your countries local customs and import service where it will be processed and passed to your local post office. Many countries in the EU offer further tracking information however most countries outside the EU will only show proof that it has been shipped and proof of delivery. Once an order has been packaged and processed, we cannot modify any orders. We also cannot re-route or modify any packages once the order has been shipped out. If you no longer want your order, you can refuse the package upon delivery. Simply tell the shipping carrier to return to sender and it will be shipped back to our warehouse. Naturally you will be billed for the postage costs incurred. For further details on refunds, please visit our Return Policy page. You may be subject to import duties and taxes, which are levied once a shipment reaches your country. Additional charges for customs clearance must be borne by you; we have no control over these charges and cannot predict what they may be. All paperwork is filed automatically by custom USPS software and includes the full value of the products as shown on the website and does not include any discounts or coupons. Customs policies vary widely from country to country; you should contact your local customs office for further information. Additionally, when ordering from cronusmax.com, you are considered the importer of record and must comply with all laws and regulations of the country in which you are receiving the goods. if you refuse to pay import taxes the goods will be returned to us and you will be refunded for the items as soon as they arrived minus any postage and packing costs. Please do not ask us to falsify paperwork so you pay less taxes. If you receive a damaged package, contact us at 434-227-4394. There is only a three day grace period once the item has been received. From there we will submit a claim for a damaged package that takes 5-8 business days for processing. You have a choice to either receive a refund or a replacement for the package. USPS stipulates that we cannot file a claim for lost packages for 30 days from the date of shipping. If the package appears to have been tampered with or is simply missing items, please call us (434) 227-4394. What happens if the post office says my package is delivered but it's not there? You need to call the Post Office immediatley to find out where the parcel was dropped off - all delivery agents have GPS locators when they scan the parcel so a record can be retrieved. You will either discover that it was dropped off at the wrong address or wrong mailbox, that it was not delivered at all and is still in their system, or it was stolen. You are fully insured and covered for the first two scenarios. Unfortunately, we are not responsible for any goods that are stolen. Are there days other than weekends cronusmax does not ship orders? We follow the United States Federal Holiday Schedule. While we may still process orders and send customers their tracking number on some of these days, that tracking number will not be immediately active until the next business day when USPS is back in operation.